He didn't quite write off the season, but Rory McIlroy confessed he's looking forward to 2018 now after a two over 73 dashed his wafer-thin hopes of ending his three-year major drought at the US PGA. The world No 4 confessed that he simply didn't hit enough fairways and paid the price in the thick Bermuda rough at Quail Hollow as he ended the day in the bottom half of the field on four-over par. Given the rib injury he suffered in January and his change of equipment, the four-time major winner is far from 100 percent competitive. While he can play as many tournaments as he likes, he is unable to practice with the frequency or intensity he would like. “It’s not a factor when I'm out on the course, but it's a factor when I'm off it in terms of how much I can practice and how much time I can put into it,” he said. “So it's tough. It's Catch 22 because I want to play and I can play, but I can't put the practice in that I need to, to maybe get myself up into contention. "We'll see where I go from here; I'll play tomorrow, assess my options for the rest of the year. “I've still got a few big tournaments left; it's just whether I play in all of them or I take a little bit of time off to try and get 100 per cent healthy." While he knows it’s a risk, he plans to continue to attack with the driver today in the hope he can make birdies and sneak a top ten finish. But if he has a repeat of yesterday’s play, he will struggle. Ten shots off the lead at halfway, McIlroy needed to get off to a fast start to have any chance of putting pressure to the leaders. But he went backwards instead, dropping two shots in his first five holes, before following a birdie at the par-five seventh with back to back bogeys at the 10th and 11th, where he found deep rough near the green. "It's playing tough," McIlroy said after a round that took five hours and 20 minutes in the 90-degree heat. 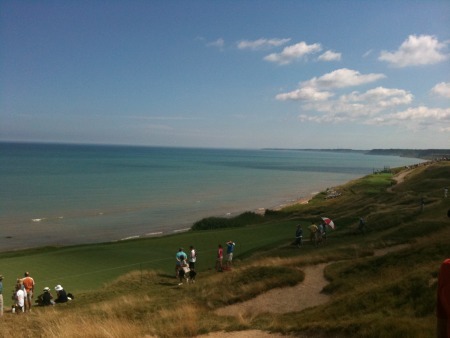 "You get off to a bad start, two over through five are you then putting pressure on yourself to birdie the birdie holes. "I didn't get off to the best of starts but that's the way it is. After playing practice rounds, I felt like there was a decent one out there. "The way the conditions have been the last three days, I haven't seen a low score out there for me." While he birdied the par-three 13th with a superb tee shot to three feet and picked up another shot at the par-five 15th, he missed the 17th green by inches and bogeyed again. Quail Hollow is a different course to the one where he won in 2010, and 2015 and McIlroy confessed that he simply couldn't make birdies from the rough. "I definitely haven't driven the ball well enough the last few days to give myself chances for birdies and build a score,” he said. “So I just need to hit some more fairways tomorrow." Setting his sights now on that elusive low round and a possible backdoor top ten finish, he had no plans to hit more three woods to give himself a chance to find more fairways. "I guess at this stage of the tournament what is the point," he said. "You'd rather be 300 in the fairway than 350 in the rough. I'm not giving up that much. We'll see what I do tomorrow. "I felt good with the driver all week. Sometimes when you are trying to cut corners and take it over angles, fairways just become narrow for you. "You may as well try to get it down there. I swear the rough is growing overnight. "There was a couple of spots out there I hit it, I thought I was okay and I could barely get it to the green. "So the goal now is I want to sign off on a positive note. It hasn’t been the week I wanted. If I can finish in the red tomorrow, that could be a top ten. "That’s a hollow victory in some sense but at least I would sign off on a positive note." Open champion Jordan Spieth, who was attempting to become the youngest winner of the career Grand Slam, closed with a double bogey six for a 71 that leaves him on three over. And he confessed that the US PGA may become a major challenge for him as the years go by. As Shane Lowry shot a three over 74 to slip back to tied 47th on four over, overnight leader Kevin Kisner shot a one over 72 to lead by one stroke on seven under from Chris Stroud (71) and Hideki Matsuyama (73) on seven under par. Justin Thomas (69) and Louis Oosthuizen (71) are tied fourth, just two behind but Jason Day bogeyed the 17th and then made a disastrous quadruple bogey eight at the 18th for a 77 to slip back to tied 16th on level par. Stymied by a tree in the right rough, Day tried to play a hook down the line of the cart path but ended up unplayable in bushes and eventually took five more to get down afte a penalty drop. Rory McIlroy admits he must stop acting the “muppet” and have more patience in his quest for US PGA glory. Watershed for McIlroy: "A couple of months ago... 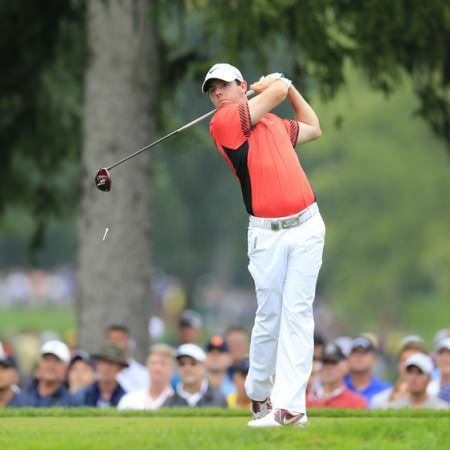 I would have been going home"
Rory McIlroy tees off on the ninth. Picture: Eoin Clarke/www.golffile.ieRory McIlroy blasted four birdies in his last seven holes to keep his US PGA defence alive in what could go down as the watershed moment of his season. Duval urges McIlroy to take time off: "I am watching his golf swing deteriorate"